Orwall is a great root app that can make sure all your internet communications on your android phone are reliably routed through Tor via Orbot. And it is presented as one of the must-have apps for privacy and security by for example the Mission Improbable article. I know you should probably not log into gmail and other user-identifiable accounts (e.g. twitter) through tor if you also want to be "completely" anonymous through tor. But from the point of view of just wanting to be less tracked and exploited by all the people and 3rd party organizations in the world, is it a good idea or useful to route e.g. the Google services, FB, Twitter through Orwall? A difficult question to answer decisively. The tl;dr is that if you are performing highly sensitive activies you should not be doing them on the same device as your normal day to day activies. This is a concept called Compartmentalization. When you take your whole operating system and stick it behind transparent proxying, everything goes over Tor if it can. Everything that goes over Tor will, by default, use the same circuit. Your operating system updates, your email, your browsing, and fetching information about media you play will all share the same circuit. The exit node could connect all of these things together and ascribe them to a single entity. This means things intended to be anonymous could be linked to things directly linked to your identity, or between psuedonyms. 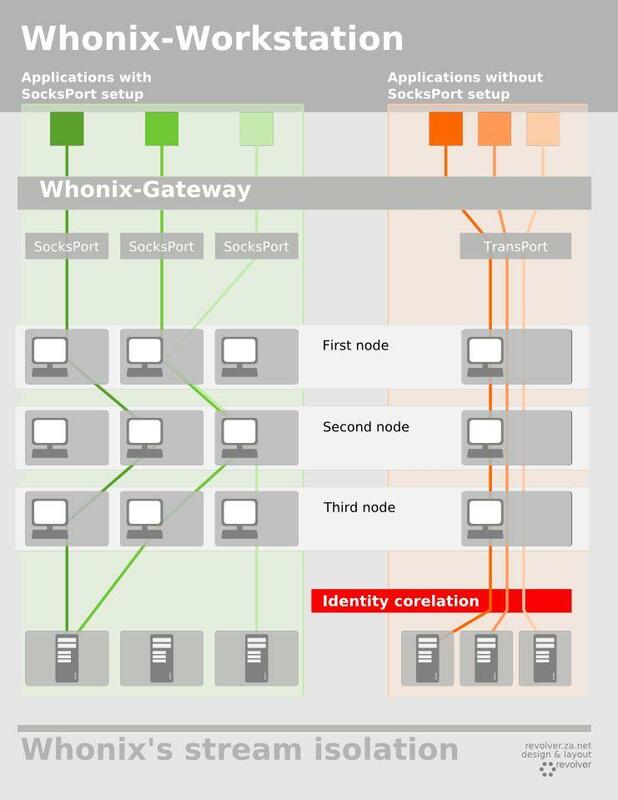 See also: the Whonix Stream Isolation Infographic. Some applications, even some security applications still check for and download unsigned updates over plaintext. This is not safe in any scenario but becomes a more obvious problem on Tor. Now, these applications aren't bad because of Tor. These applications are totally unfit for purpose on the internet at all (ISPs get hacked, routers get rooted, wifi gets cracked, etc) but it is far simpler for an attacker to gain a Man-in-the-Middle position through being an exit relay in a Tor circuit (or posing as a free VPN provider). So generally, no. You don't want to just Tor everything. The alternative (where everything is torified, isolated and audited to be free of leaks) is very difficult to setup and you should also consider lateral leaks of information (an application that you don't torify might leak information outside of Tor about applications you are torifying because they're running under the same operating system and can infer information from each other). So do you consider your local ISP or a potentially malicious exit relay operator a bigger threat? This depends on your situation, there is no definitive answer but Transparent Proxying everything will always be sub-optimal. A VPN is best for your case I imagine. All the programs beside your browser knows who you are and probably phones home. This just puts more load on Tor than nessasary. It could obscure how much data you are using browsing(to fight correlation), but the VPN would offer the same(The VPN is much less likely to turn over logs than Facebook and Google would to assist in correlation). And they could have access to Google and Facebook servers. Google Services spys on the apps you use and it is possible it watches data and collects data that could be used to fingerprint your browser. If you want a secure phone ideally should use a Nexus 5X or 6P with Copperhead OS. If you can't get your hands on one of those Lineage OS with no Gapps could be effective. However, Android has many security flaws coming out all the time. Do not rely on this for anything confidential. Not the answer you're looking for? Browse other questions tagged orbot android or ask your own question. How to install executable or *.exe and android apps or *.apk files files in Tails?